Laurent Grasso, SolarWind, 2016 © ADAGPSemapa Paris Rive Gauche / Ciments Calcia Production Eva Albarran & Co. Photo by Romain Darnaud. Sean Kelly is delighted to announce that Laurent Grasso's first permanent public artwork, SolarWind, will be on view beginning Monday, January 25, 2016. 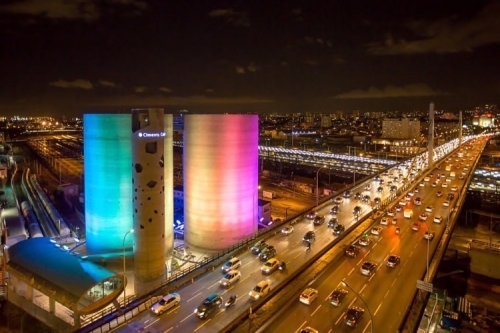 Commissioned by Paris’s 13th district council, SEMAPA and Ciments Calcia, and produced in partnership with the Space Observatory and the CNES (National Centre for Space Studies) art-science laboratory, SolarWind will visually translate solar activity and cosmic meteorology in real time through an ever-changing, colorful light installation on the two 40 meter high concrete silos at Calcia’s cement manufacturing distribution center. SolarWind will be visible to more than one million motorists traveling France's Périphérique orbital highway every day. For more information, please visit solarwind.fr.